The healthy and safe education environment is highly important for the success in education. Knowing that, our Institution carries out the health services in the healthcare center which is a separate, two-story building in Marmara Education Village campus and in the school infirmary. a) Periodical Examinations: All the personnel especially the personnel in kitchen, refectory and cafeterias are examined before recruiting and examined annually in order to determine whether any obstacle for working in terms of health and hygiene. In case of illness the personnel is suspended from the work until the treatment is completed. The transactions in relation to the examinations are recorded in the personal health files of the employees. b) Health Examination (for infectious diseases): The relevant personnel shall have lung x-ray once a year and have health examinations for infectious diseases. c) The relevant personnel are trained on personal hygiene, food hygiene, hygiene in collective nutrition systems and environmental hygiene periodically. d) Refectories and cafeterias are observed in terms of health by means of daily control charts. e) The chlorine level of water is monitored daily; and the bacteriological analyses are conducted once a month. a) In cooperation with the parents, the health assessment questionnaires are prepared for the students and the personal health file is created for each student by means of general health examination. All the health problems and treatments are recorded in the files during year; therefore it is possible to carry out efficient health observation. Each Marmarian has a personal health file. b) The vaccination of the students and personnel against the risk of illness and accidents (routine vaccinations, flu vaccine, Hepatitis-B, Tetanus vaccine etc.) are performed by means of campaigns. c) The school community is informed about the current diseases and the health risks to be refrained by means of audiovisual methods including conferences, panels, wall newspaper, leaflets etc. 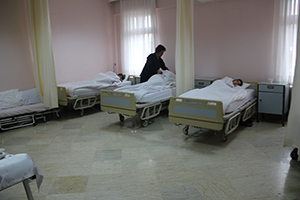 a) The examinations and treatments of the students are carried out within the scope of primary healthcare services provided in cooperation with Marmara Eğitim ve Araştırma Hastanesi, which is the Faculty of Medicine in our University; the patient shall be transferred to other health institutions if required. b)There are 3 doctors in our healthcare center one of which provides service whole day. Moreover there are a nurse, three health officers, three ambulance drivers and a housekeeper in our health center which renders 7 days 24 hours service to our students in case of any possible health problem. The closest hospital to our institution is Süreyya Paşa Eğitim ve Araştırma Hastanesi which takes 5-6 minutes to reach. 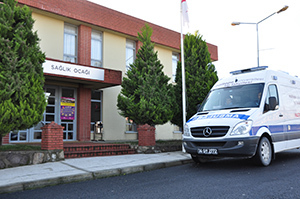 It takes 10-12 minutes to reach Marmara Eğitim ve Araştırma Hastanesi in Maltepe by ambulance. Another important issue that our institution pays attention is to raise individuals with strong mental health. Apart from the effective works of the psychologist and guiding teachers, the mental health observation-monitoring works are carried out with the participation of the parents in cooperation with the MÜPDAEM (Maltepe University Psychological Counseling Research-Apply and Education Center) which provides professional consultation, support, research-apply and education in relation to the mental health.